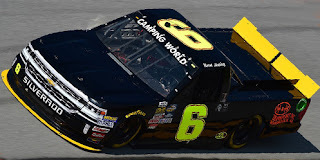 Norm Benning picked up the 11th last-place finish of his NASCAR Camping World Truck Series career in Saturday’s Fred’s 250 Powered by Coca-Cola at the Talladega Superspeedway when his #6 H & H Transport Chevrolet fell out with engine trouble without completing any of the 95 laps. 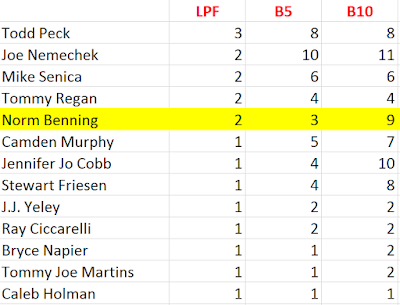 The finish, which came in Benning’s 180th series start, was his second of the season, his first since Kentucky, nine races ago. 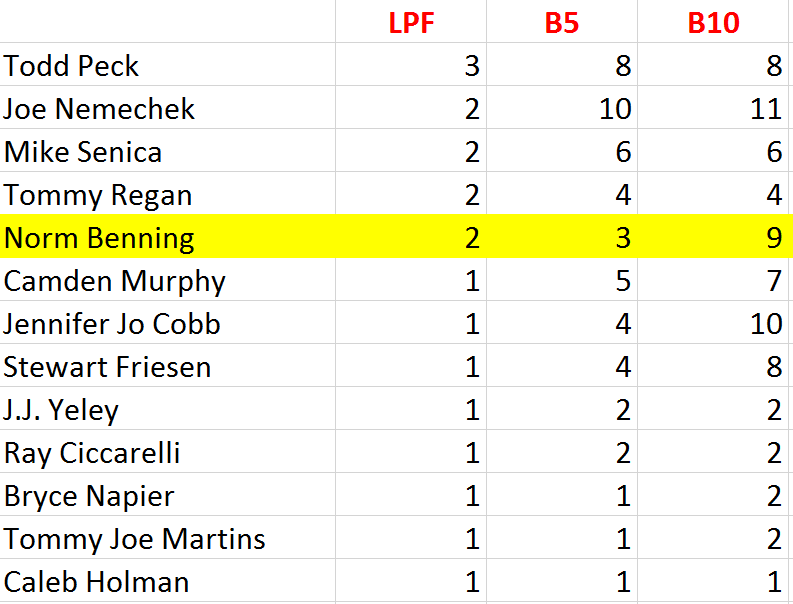 The finish put Benning into a three-way tie for the third-most last-place runs in series history, tying 1999 LASTCAR Truck Champion Phil Bonifeld and two-time title winner Mike Garvey. There have now been five consecutive Truck Series races where the last-place finisher failed to complete a single lap, a new NASCAR record. After missing the first three races of 2017, Benning has made every race since, and has also entered a second truck, the #57, in several races to fill out short fields. In that time, Benning’s best finish of the year came at Eldora, where he rebounded from a DNQ in 2016 to finish a strong 13th. For Talladega, Benning would not enter his team truck, the #57, and only field his primary #6. For the first time since Chicagoland, the #6 would also carry associate sponsorship as Woodstock, Georgia’s H & H Trucking would have its logos on the rear quarter-panels. Benning ran slowest of the 29 drivers who completed at least one lap in Friday’s opening practice. His best lap of 167.968mph was more than seven full seconds off the pace of session leader Cody Coughlin. He found some speed in Happy Hour, ranking 21st of 26 with a lap of 175.298mph. But in qualifying, he was the only driver who failed to turn a lap, and would start 31st on the grid. He was still guaranteed a starting spot in the field, a grid which was reduced from a full 32 after Mike Affarano withdrew his #03 Calumet City Auto Parts / Stop Bullying Chevrolet on Friday. On Saturday, Benning, along with Josh Reaume in Beaver Motorsports’ #50 Ever-Fi Chevrolet, was sent to the rear for the start for unapproved adjustments. Both were joined by Kaz Grala, who one lap before the green fell back from 12th on the grid due to an engine change. By that point, Benning was not on the track, citing engine trouble. Another truck, Joe Nemechek in his #87 D.A.B. Constructors Chevrolet, surrendered 21st on the grid to line up next to Reaume in the back, one row behind Grala. When the field took the green, Nemechek lost touch with the pack as the field accelerated, then pulled in after two laps to take home 31st. Presiding over his son John Hunter Nemechek’s team, the NEMCO Motorsports crew recovered from a mid-race accident to come home 6th – just enough to make the next round of the Playoffs. Grala was next to fall out, eliminated in the day’s first multi-truck accident on Lap 19, and lost his own spot in the Playoffs as a result. Rounding out the Bottom Five were Ryan Truex, whose #16 Bass Pro Shops / Tracker Boats Toyota was gobbled-up in the Grala accident, and Regan Smith, whose #92 BTS Tire & Wheel / Advance Auto Parts Ford was eliminated in the Turn 3 wreck that damaged John Hunter Nemechek’s Chevrolet. Saturday’s race went to Parker Kligerman, his second Truck Series victory and his first since this same Talladega round in 2012. This time around, Kligerman drove for longtime car owner Charlie Henderson, whose team was featured on this site earlier this year at Eldora. Though active in NASCAR’s top three series since 1982, this was only the team’s 41st Truck Series start, and marked Henderson’s first NASCAR victory since June 3, 1989. *This marked Benning’s first Truck Series last-place finish at Talladega and his first on a plate track since the 2011 opener at Daytona. It was also the first Talladega last-place finish for the #6 in Truck Series history. *Benning joins Mike Harmon, whose engine let go in 2014, as the only two drivers to fail to complete a lap of a Truck Series race at Talladega. Harmon himself finished 20th on Saturday in TJL Racing’s #1 Chevrolet.